On September 11 at exactly 10:28 a.m. the interior of the WTC Oculus will be filled with natural light, a symbol of light shining through the darkness of tragedy. 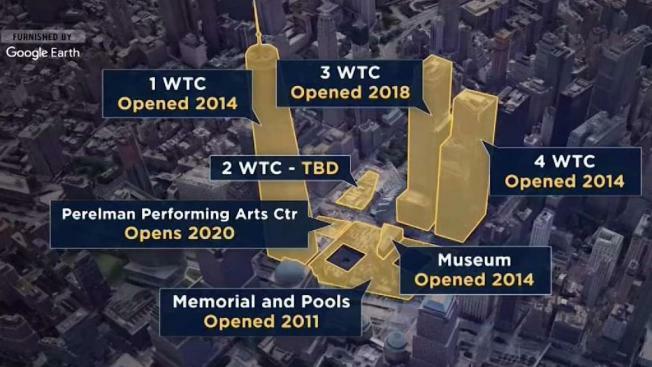 On the approaching anniversary of September 11, a look at what's been rebuilt and what is yet to come. Andrew Siff reports. On September 11 at exactly 10:28 a.m., the same time that the North Tower fell back in 2001, natural light will fill the WTC Oculus. In a path referred to as the “Way of Light,” the sunlight will make its way across the Oculus floor, along the exact axis of the building. Santiago Calatrava designed the WTC Hub to allow for this powerfully symbolic moment to happen every year. Visitors to the World Trade Center Oculus on September 11 will have the chance to experience a symbolic moment in honor of those who died in the attacks nearly two decades ago. Next Tuesday, Sept. 11, at exactly 10:28 a.m. -- the same time that the North Tower fell during the attack back in 2001 -- the sun will shine through the Oculus skylight to illuminate the interior of the building in a natural glow. In a path referred to as the “Way of Light,” the sunlight will make its way across the Oculus floor, along the exact axis of the building. The moment acts as a powerful symbol of the light that continues to shine through the darkness of the tragedy. When Santiago Calatrava set out to design the World Trade Center Hub following the tragedy of 9/11, his positioning of the Oculus was very intentional to make this poignant moment possible every year, a spokeswoman for the building said.